Audi Midtown Toronto. Photo courtesy Ontario Concrete Awards. The winners of the 2016 Ontario Concrete Awards have been announced. The awards recognize design and construction innovation and excellence using the industry’s most ubiquitous material, and in a variety of different building types and applications. The winner in the infrastructure category was the Derry Road/CN Grade Separation project for Halton Region, northwest of Toronto. The project includes a long overpass with a cast-in-place deck and precast arches, on a site webbed with highways, rail lines and a transformer station. It also has a huge on site stormwater management component. The team included R.V. Anderson Associates as engineers and New-Alliance as contractors. The Institutional Building award went to the Reactor Materials and Testing Laboratory at Queen’s University in Kingston. The building stimulates the conditions inside a nuclear reactor, so requires a “bunker” type structure with concrete walls 6 ft. thick, reinforced with fibreglass rebar. The concrete absorbs neutrons and dissipates the energy. Read Jones Christoffersen were the engineers, Diamond Schmitt/Shoalts & Zaback were the architects, and T.A. Andre & Sons was the general contractor. 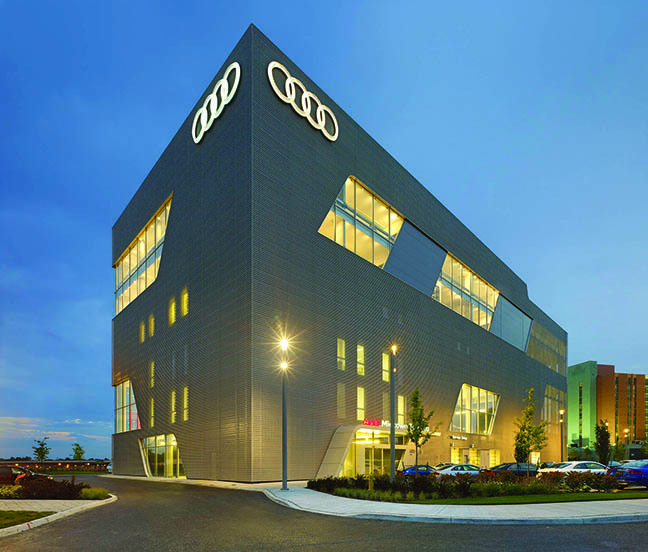 For Structural Design Innovation, the award went to the Audi Midtown Toronto building, located near the busy Highway 401/404 interchange in the city’s northeast. The striking monolithic structure has sales on its lower levels, offices on the third level, vehicle service bays on the fourth, and parking on the three floors above. Stacking the different occupancies on top of each other created design challenges, with the sales areas needing large and open column-free spaces, whereas the service areas and parking above required bays. This mixture required many transfer columns and complex detailing. The team included Read Jones Christoffersen engineers, Teeple Architects, and Eastern Construction. For a Mid-to-High Rise Residential Building, the award went to The Onyx at the Barrel Yards in Waterloo. Consisting of two 22-storey point towers, the project evolved from conventional construction into a precast concrete structure that was constructed five months ahead of schedule. The closely collaborating team involved HGS as consulting engineers, Turner Fleischer Architects, and contractor Stonerise Construction. Auburn Development are the owners. The Material Development & Innovation award went to River City Condominium Phase 2, Toronto. Located in the new West Don Lands development downtown, the project’s unique façade includes rough board-form concrete. The team involved Adjeleian Allen Rubeli engineers, Saucier + Perrotte/ZAS architects, Bluescape Construction Management. Urban Capital is the owner. The Sustainable Concrete Construction category award went to the W. Ross MacDonald School Senior Student Residence for the Blind and Deaf-Blind. Located in Brantford, west of Toronto, the reinforced cast-in-place concrete structure helps to reduce the noise and vibration for the sensitive students. Other features include specially designed straight corridor walls for wayfinding, a large atrium that acts as an acoustic wayfinding device and has cantilevers and sunshade overhangs. The Architectural Merit award went to the Queen Richmond Centre West, Toronto. This office building complex is best known for its extraordinary steel support structure, but above that is an 11-storey office tower built in concrete partly for thermal efficiency. The team includes Stephenson Engineering, Sweeny &Co Architects, Eastern Construction and owner Allied Properties. Architectural Hardscape: Rouge Crest Park in Richmond Hill, north of Toronto. A waterpark with coloured concrete artforms was designed by a the team of Engineering Link, Scholl & Company architects, with Rutherford Contracting. Specialty Concrete Construction: Concrete House, Toronto. The team includes Blackwell Structural Engineers, Angela Tsementzis Architect and Marcus Design Build. Owners are John Pylypczak and Diti Katona. This article was originally published in the Canadian Consulting Engineer.